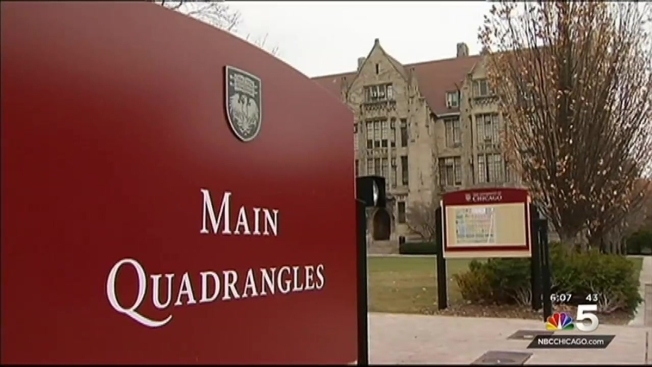 A 21 year-old was charged in connection with a "threat of violence" at University of Chicago that prompted school officials to cancel classes Monday. Jabari Dean, who has been identified as a University of Illinois at Chicago student, has been charged with transmitting a threat in interstate commerce, the U.S. attorney's office in Chicago said in a statement. The charge carries a maximum sentence of five years in prison. Dean was scheduled to make an appearance at 3 p.m. before U.S. Magistrate Judge Susan E. Cox. The attorney's office said an email address linked to Dean was used to post a threat that read: "I will execute aproximately (sic) 16 white male students and or staff, which is the same number of time (sic) Mcdonald (sic) was killed." The threat had been posted Saturday, only days after the city released a video of Officer Jason Van Dyke shooting 17-year-old Laquan McDonald 16 times, authorities said. “We are monitoring this situation closely and are concerned about the impact this has had on our campus and the University of Chicago,” UIC Chancellor Michael Amiridis said in a statement. Dean appeared in federal court Monday but didn't enter a plea, and his lawyer declined comment afterward, The Associated Press reported. President Robert Zimmer sent a letter to the campus community Sunday to announce the cancellation of all classes and activities at University of Chicago’s Hyde Park campus through midnight on Monday. In the letter, which was also posted online, Zimmer wrote that the university was informed by FBI counterterrorism officials that someone posted a threat of gun violence online. The individual reportedly mentioned specifically “the campus quad” on Monday morning at 10 a.m., according to the letter. “Based on the FBI’s assessment of this threat and recent tragic events at other campuses across the country, we have decided in consultation with federal and local law enforcement officials, to exercise caution by canceling all classes and activities on the Hyde Park campus through midnight on Monday,” Zimmer wrote. All non-medical faculty, students and non-essential staff are asked not to come to the Hyde Park campus on Monday. The letter also asked those who will be on campus to remain indoors as much as possible, including students in College Housing. The University of Chicago Laboratory Schools, the University libraries, the Quadrangle Club, and other campus facilities were closed on Monday. Zimmer said in a separate letter Monday evening that the FBI has concluded their investigation into the threat and that normal operations will resume Tuesday. The University of Chicago Medical Center remained open with added security measures, according to the University. The school expects to resume normal university operations on Tuesday. Anyone who sees anything unusual should contact University of Chicago Police at 773-702-8181.